We kicked off the weekend with unseasonably warm weather and beautiful blue skies upon arrival in Vienna. Catching up with our friends Philippe and Charlotte over a rooftop BBQ at their place made for an especially warm welcome. After a much needed power nap, we set out to discover some of the city’s more family oriented charms like the Prater and its amusement park (Prater is also home to Vienna’s famous Ferris Wheel). From fun ride to bumper cars and riding a mini-train, the kids had a blast at Prater, and Olivia adjusted well to the local time and routine (thankfully!). Our day trip to Kahlenberg & Grinzing (nearby Vienna suburbs laced with vineyards, heurigen or local taverns that make and sell wine, and beautiful hilltop views of the city), was more of a balance between kid and adult activities. The fall scenery was in fully effect with touches of red, brown, and gold that accentuated the green backdrop. A stop for lunch at one of Philippe and Charlotte’s go-to places in Grinzing served as the first of many encounters with delicious Viennese schnitzel. As the afternoon wore on, we checked out Palais Lichtenstein, a garden palace consisting of a children’s playground, the palace and its garden, and an outdoor cafe – only in Vienna! The playground was very popular with the kids and became a regular stop for the remainder of our days in the city. As Monday morning came along we hopped on the Railjet (fast train), to Prague where we spent the next couple of days with Rich and Alina. Slicing through the scenic countryside brought back memories of our world trip (6 years ago). We visited some of the fairytale city’s charms, the old town square (Stare Mesto), Prague Castle, some of its ornate bridges while losing ourselves among the intricate streets. Exploring the city with Alina and Rich was also an introduction to some of their favorite cafes and restaurants including the elegant Cafe Savoy, and the awesomely and delectable Wine & Food (an Italian eatery akin to Eataly back in New York). Although we only spent two days together and had not seen Rich and Alina since September of last year, we made the most of catching up and getting a taste of their life in the magical city. Hopefully it won’t take another year for us to get together again, being an ocean apart is more of a mental barrier than physical. Returning to Vienna midweek left us with four remaining days to hang out in the city. Each day Brigitte, O and I would set out to check out different sites and take a deep dive into the city’s cultural offerings. Stopping for tea, coffee (and desserts of course), became part of our daily routine. 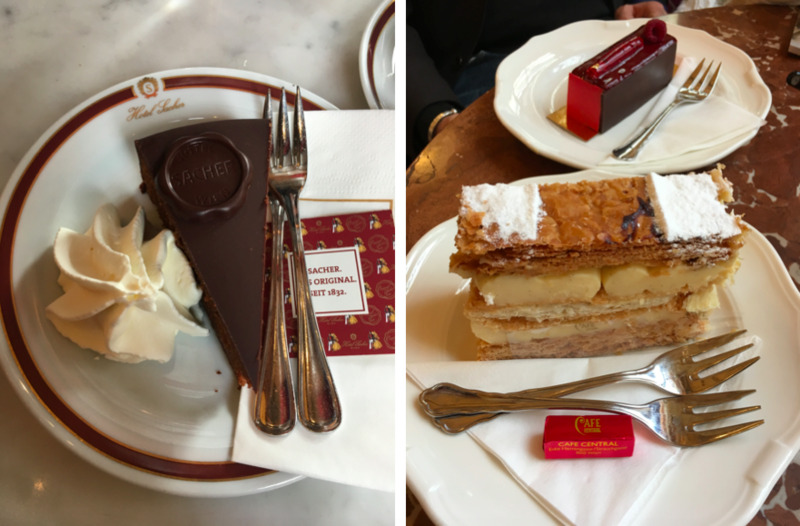 Vienna is known for its cafe culture: both Cafe Sacher (known for its eponymous Sacher torte or cake), and Cafe Central offered us a great slice of the cultural pie. One of our favorite dining places became Zum Schwarze Kameel (Black Camel), an Art Nouveau-style foodie destination that has been in business for nearly 400 years. It’s prime location in Vienna‘s old city district (now the heart of luxury shopping and other fine restaurants), makes it a staple with Viennese patrons (former patrons even included Beethoven). As the weekend approached we took a day to visit the Schönbrunn Palace which eluded us on our trip to Vienna six years ago. The Baroque 1,400+ room palace is one of Austria’s most notable architectural wonders and our 23-room tour offered an acute sense of the Habsburg’s lavish lifestyle. Although blue skies weren’t meant to be on that particular day, the palace grounds were still impressive and we enjoyed a combination of kid and adult attractions while soaking up Vienna’s rich history as a world empire. The expansive palace gardens are host to elaborate array of flowers, statues, mazes, playgrounds, and walking paths, where we spent a good part of the afternoon. As our last couple of days wound down we reflected on how wonderful this trip was, reconnecting with friends and gaining perspective into two beautiful cities through the local lens. Classic and classy Vienna presented itself as an eternal amalgam of centuries old art, culture, history and imperial might. All the while timeless Prague absorbed our curiosity and enveloped us in its magical charm. It was also amazing to see things through Olivia‘s eyes, her remark about how beautiful the “old” buildings were only inspires us to see more.